In Oman, there is no set dress code for what a woman should wear. But, it is an Islamic country after all, so there are certain expectations for what can and cannot be worn. Expat women can wear what they'd like, but you are expected to dress modestly. I am thinking, no shorts above the knees and sleeves to at least the elbow, but I am not very good with following that myself. So perhaps that's not true. I have seen expats wearing short shorts and skirts and shirts baring their midriff at the grocery store or shopping malls. So it's not like you can't wear it, but I'm not sure why you would. Especially when you can attract unwanted attention (from all perspectives). If your house is the farthest one from the beach in all of Muscat, it is still probably only a 15 minute drive for you. There are also some expectations of what to wear at the beach. A typical bikini or exposed bathing suit should probably not be your first choice, but if it is and there is police nearby, you should not be surprised if they request for you to cover up. I have read that many expat women will attend private beaches or hold memberships to private facilities that offer pools so that they can wear what they'd like. I'd just say, better to be safe than sorry when it comes to choosing your clothes. It is a bit difficult because of the heat and if you are used to something else, but you get accustomed quickly and learn to appreciate it. 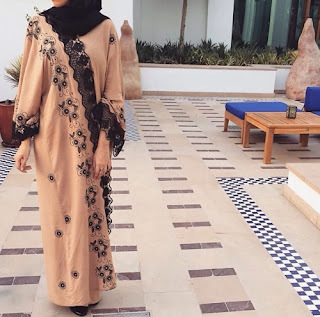 For Omani and other Muslim women, I have seen many different kinds of Islamic wear; just the hijab, niqab, I think a Burqa a few times, but the most popular must be the abaya. So what is an abaya? 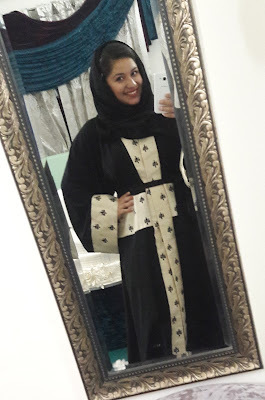 An abaya is a form of dress that can be worn by Muslim women. It is a floor length, long sleeved, cloak so to speak. It is meant to be worn over everyday street clothes, when a woman is out and about. 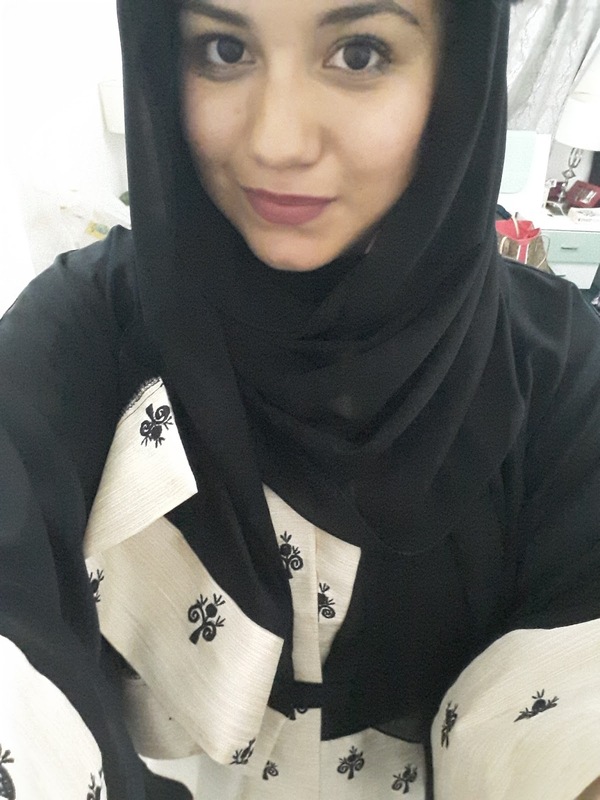 It is not considered traditional Omani dress, but a popular option especially in the GCC region. I believe they are traditionally black, but there are a wide range of options in colors, embroideries, and styles. The abaya can be paired up with a hijab, a loose headscarf, or worn without anything, and even opened from the front. 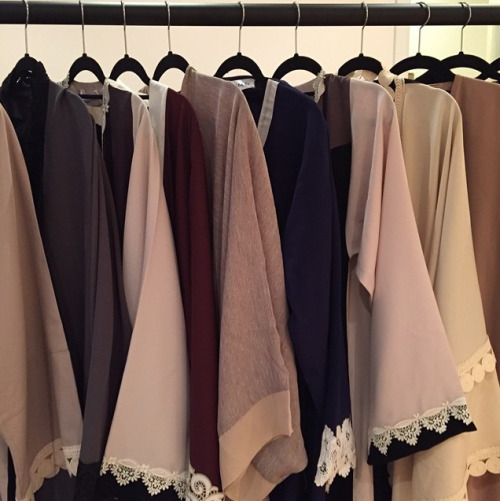 The prices can vary greatly, reaching thousands of dollars for the most luxurious abayas. Reportedly, the most expensive one in the world is a whopping 17 million dollars. 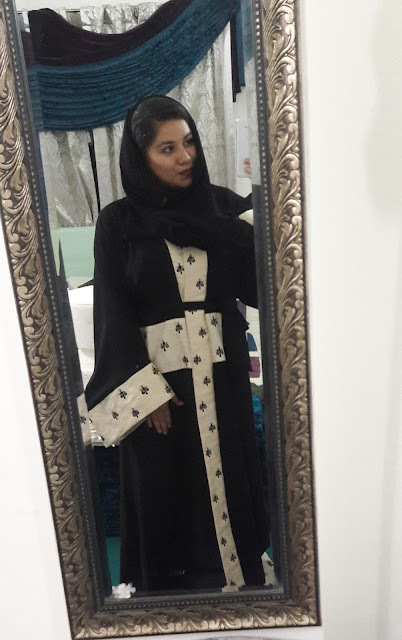 You can design your own abaya and have it tailored or buy it from the shop pret a porter. I've included some pictures below that will hopefully get you an idea of the variety. Click for sources. Variety of cremes, darker colors, and bright colors. Many designs, shapes, and ways to style. Last night, Host mom, N, and I were in the car on our way to a delivery. I'm wearing a maxi dress, so I crossed my legs and pulled underneath me to straighten the cloth. And I feel a hole, a huge hole, running from the top to halfway down the bottom, and I freak out. How the hell did this happen? After the delivery we were supposed to go to dinner down the street. We decided to go to dinner anyways and see how we would resolve it. One option was to tie my cardigan against my waist. The second option, which we opted for was to call host dad (HD) who was in a shop around the corner and borrow his turban to wrap around my waist. We arrived at our dinner spot, in a shopping plaza, and met HD there. He took N, while me and HM went to a nearby woman's shop to see if we could find a sort of abaya, to cover up with. We went to the first shop, but they were pricey and not worth it. 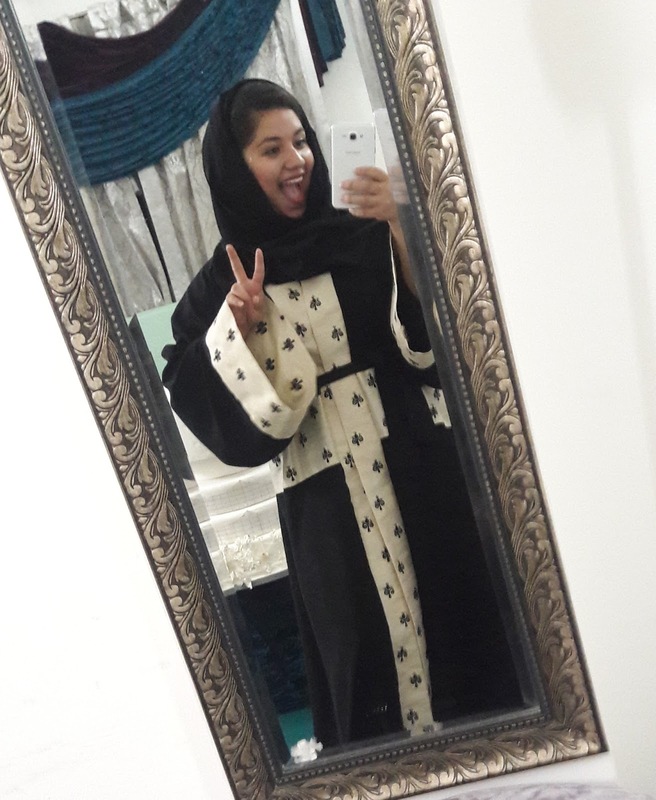 I told my HM that I was interested in investing in an abaya, so I would pay the price and get a nice one. We went into another shop, belonging to an Omani designer, Kooki & Zee. Right away we found something that caught our eyes and we all agreed it was it. It was gifted to me by them and I was so happy with it!! 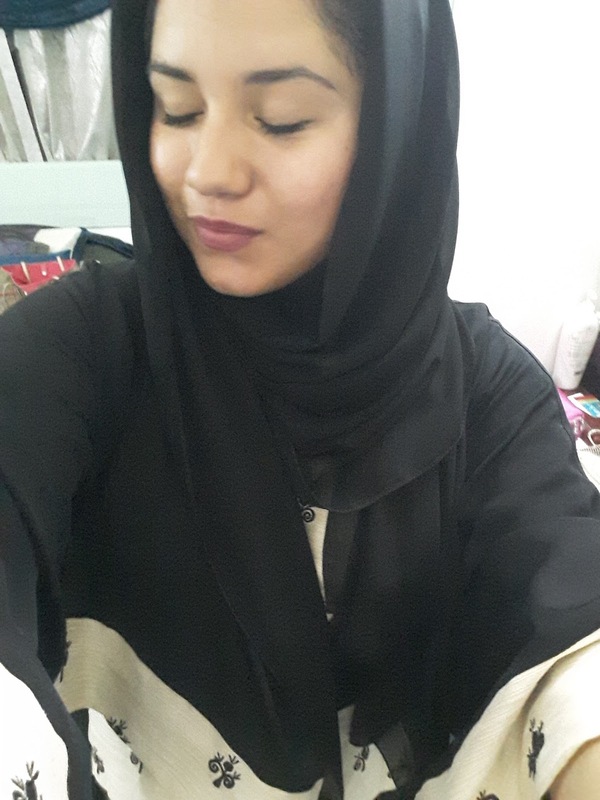 So below are pictures of my new abaya. I'm sure they are not meant to be taken in these kinda pictures, but what can I do? I felt so elegant and beautiful, I did not want to take it off. Haha. I sent my mom a picture and she said, what is this??? I explained to her, that I wanted one primarily as a keepsake or memento. And she said I scared her -_- hehe. No, still old me. But I will probably actually wear it soon, or at one time or the other, but as of now it is a bit long. I will see if I can have it adjusted but it might be a difficult because of the design. If you have questions about cultural appropriation, I would not consider this falling under that category. Mainly because it is a religious garment, that does not pertain to one culture or the other. So you can be a Indonesian Muslim or a European Muslim and have the right to wear it. Two, I think it would fall under cultural exchange as I am living here and I am invited, if not encouraged, to wear it. And three, I would wear it to an event that called for it and would be deemed appropriate. soon I will make a detailed post on traditional Omani mens' clothing.